Saucony Freedom ISO are neutral cushioned running shoes. The brand-new Saucony Freedom ISO is one of current 2017 highlights because of eye-candy design and broad marketing campaign from Saucony to extend the hype. On one hand it reminds the original Kinvara with clean upper and just one full-length foam (EVERUN) midsole, but on the other hand its high price tag (starts from USD 160) seems to prevent a wide adoption to make it as popular as Kinvara is. Anyway the Freedom ISO is a light and versatile running shoe, half way between cushioned and performance one featuring great cushioning and responsive ride with just 4 mm drop. 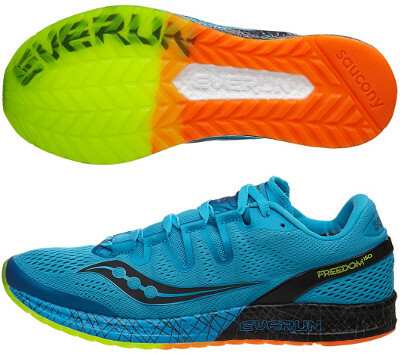 Main difference with other ISOFIT systems available in premium Saucony models out there like Triumph ISO 3 is that it gets integrated into the upper of the Freedom ISO. Engineered mesh is kind of elastic to better adapt to different areas and follows current trend of open fabrics enabling superb breathability. There is thin TPU clip wrapping the heel which Saucony names as "support frame" for enhanced stability and custom fit. Freedom ISO features first full-length EVERUN midsole in a similar development Adidas does with well-known Boost™. As usual, marketing pitch seems too perfect to become reality: abundant but firm cushioning, great response and reduced weight. We will need to wait for feedback from unbiased runners to know the truth. Other major innovation is outsole made of crystal (hard) rubber for longer durability which keeps TRI-FLEX configuration with triangular lugs providing good traction and promoting quicker response.